Everyone wants clear skin, but no one has it. OK, well maybe Jane Seymour has clear skin. But she’s the only one…on the planet. The rest of us have to deal with common skin issues, including age spots, melasma, broken capillaries, sun spots, and texture issues. Dr. Jones uses Intense Pulsed Light (IPL) technology, also known as photorejuvenation, to address all these issues and more. And IPL treatments improve the skin without the need for surgery or length recovery times. Who should opt for IPL treatment? Unfortunately, IPL doesn’t work as well on tanned or darker complexions. 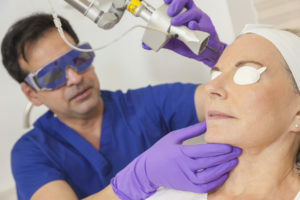 In an IPL procedure, pulsed bright light is used to treat skin blemishes. The IPL handpiece is pressed against the target areas and emits a broad bandwidth of light that penetrates the epidermis (the skin’s outer layer). The light energy converts to heat in the dermis and triggers a wound response mechanism in the body. Although there is no wound, the body perceives the heat as such and calls for the production of new collagen. Collagen is a protein that is responsible for the support structure of the skin. Its production decreases one percent each year after we turn 20. That’s why our skin becomes looser and saggy with time. The light energy also reacts with the melanin in age spots and other pigmentation issues, causing those areas to shed cells and create new skin cells in their place. Interested in addressing those skin issues? Call us at 405.418.5400 and ask about IPL photorejuvenation.